Late fall and early winter mark several celebrations for Americans back home. Thanksgiving, Black Friday, and all the days until Christmas and New Years. Though Germans do not celebrate Thanksgiving, my IES program was very sensitive to the fact that this is a special time for family and friends to come together for a large meal back home. 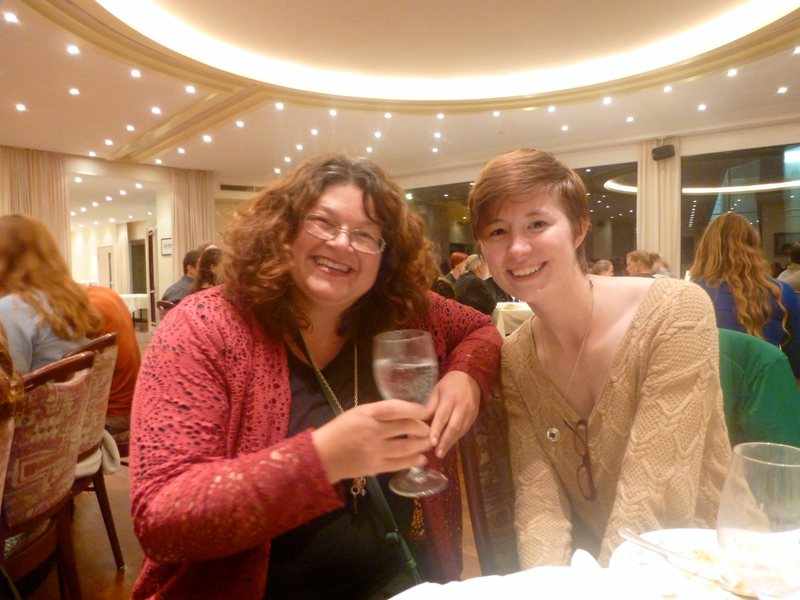 So about 2 weeks ago IES hosted a dinner at one of the fancier restaurants in Freiburg up on Schlossberg mountain. After everybody huffed and puffed up the stairs to the top – because really who is going to pay for a two minute funicular – we were so ready to eat. I entered the dining room feeling mildly underdressed, but easily relaxed as I saw my friends and two of my previous teachers, Klaus and Sandra! We still waited quite a time for the food! That may have been the only bad part of the evening though. The wait staff kept bringing a steady supply of fresh bread with butter to my table in particular (Many vegetarians, one vegan, and me, the “flexitarian”) Our first course was a kurbissuppe or pumpkin soup and our second course was a wonderfully dressed selection of salad and vegetables. The main meal was different than what I am used to. For me, it was in a good way. We got small cylinders of what I assume was their version of stuffing. Many of the other students mentioned they missed “real” stuffing. Mashed potatoes, warm applesauce, corn, carrots…. more bread. 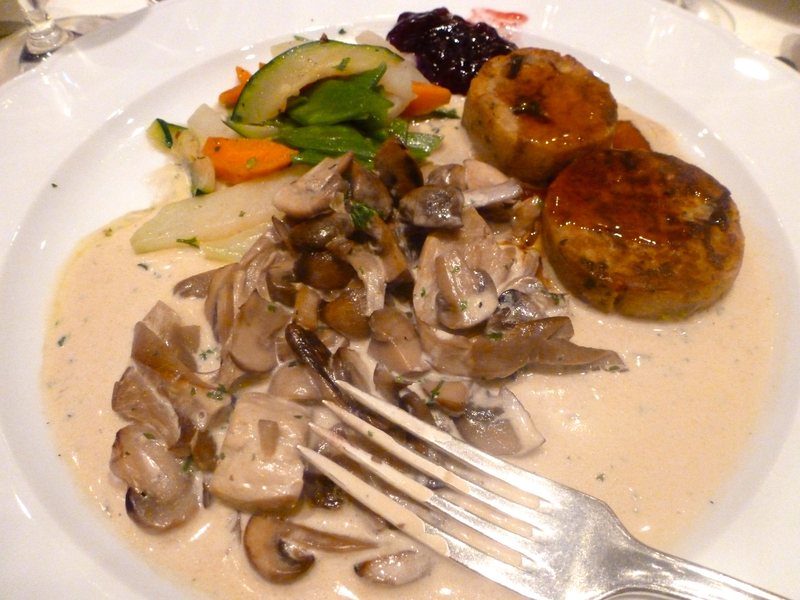 The pièce de résistance were the mushrooms in cream sauce. I have always been a huge mushroom fan, but never in my life have I experienced them in a more mouth-watering way. The one small piece of turkey I ate from someone else’s plate was very nice, better than the turkey I eat at home. The dessert left a lot to be desired (no pumpkin or apple pie), but we were entertained by two IES students, Ben and Katrina, singing songs from Sound of Music. 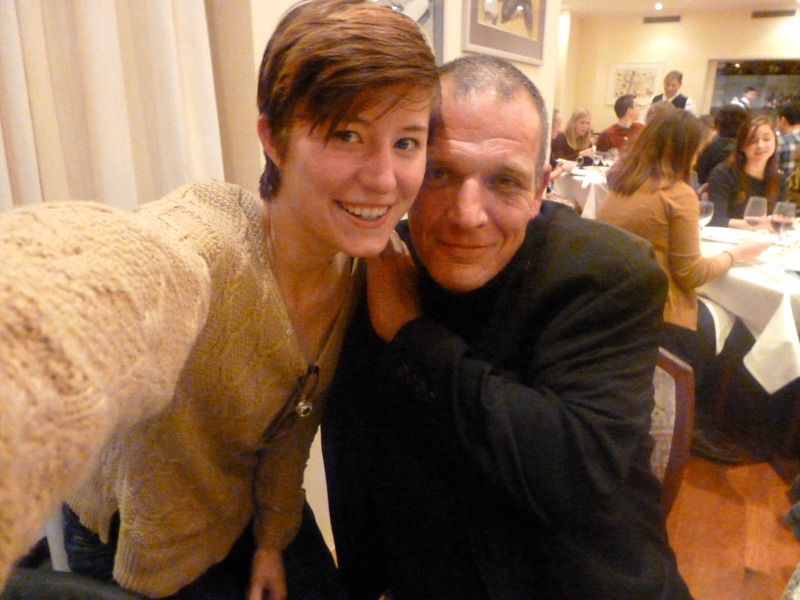 I left the Schlossberg restaurant happy and very full of Thanksgiving food. IES really pulled out all the stops. Those mushrooms…. I will never forget them. 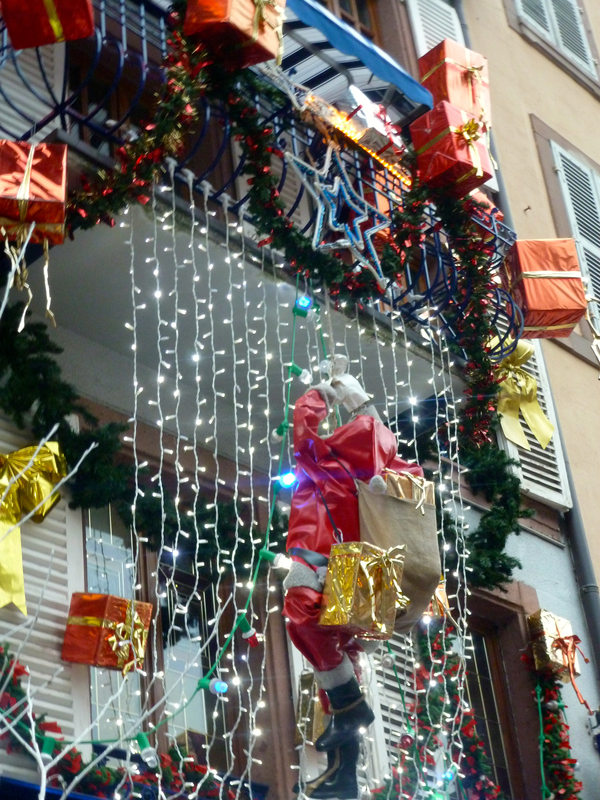 The following weekend after Thanksgiving, I began my exploration of the Christmas Market in Freiburg! There were bright lights, people selling their crafts (glass, wood, ceramics, you name it). My friend Dave and I shared glühwein which is traditionally a mulled red wine for the winter season. (P.S. 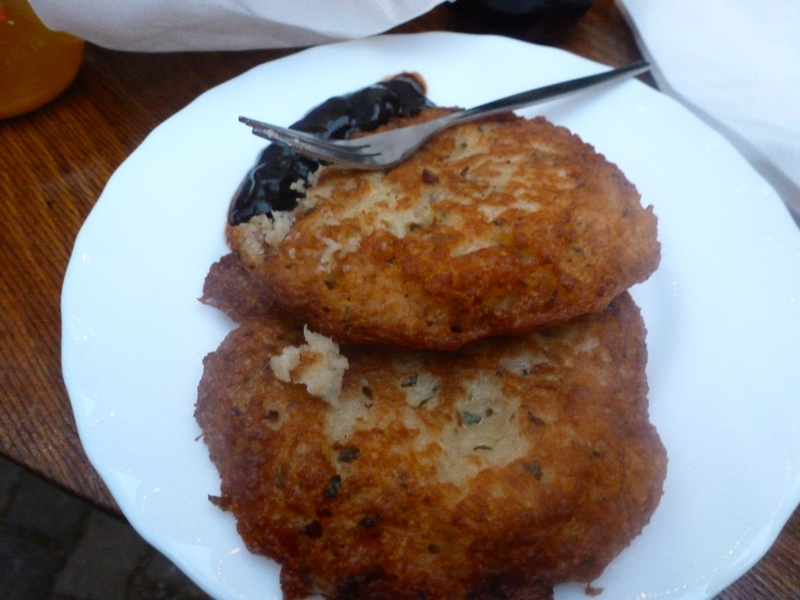 I am not a fan of glühwein) I also ate kartoffel puffers which are actually latkes! Dave had potatoes with a fried egg on top. 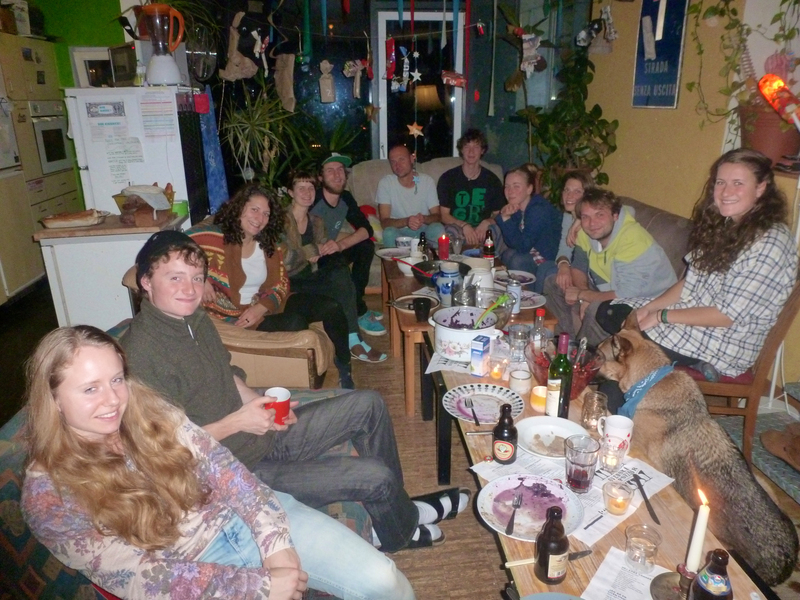 There was flammkuchen (flat pizza), pasta, sauerkraut, burgers, sausages, cheeses, and sweets. Basically a smorgasbord! I returned to the markets the following day after a few hours of ice skating with my friends. 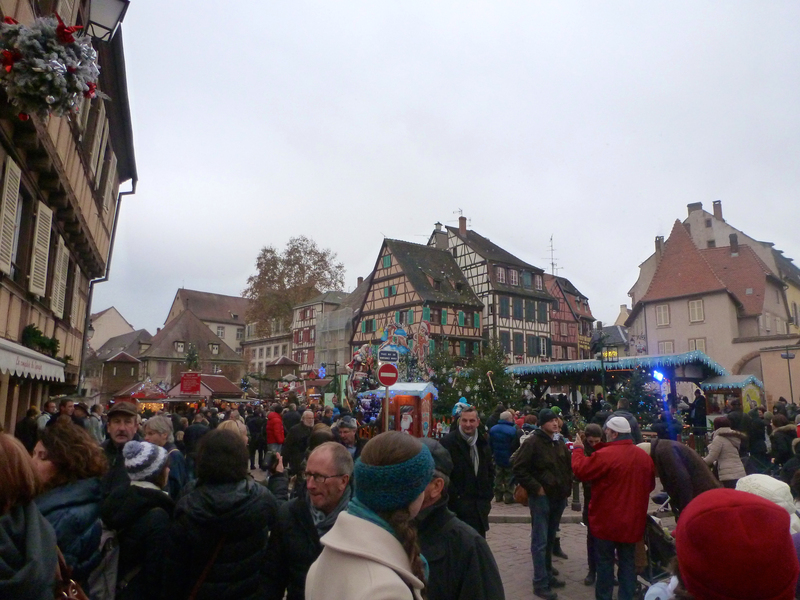 The next weekend I went to the Christmas Market in Colmar, France. First, my group got a tour of the city. 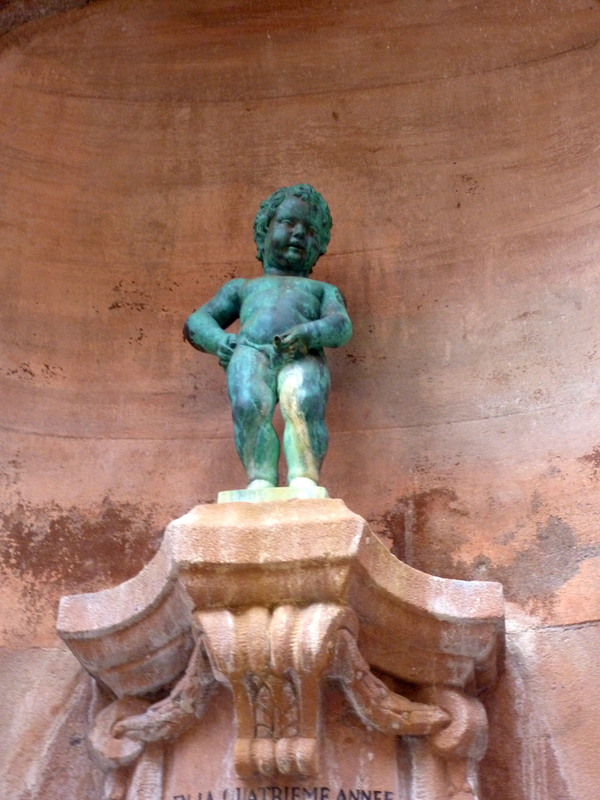 We saw their Mannekin Pis, which was made to look like the one I saw earlier this year in Bruxelles, Belgium. Afterwards we saw the birthplace of Frédéric Auguste Bartholdi, creator of the Statue of Liberty, which I saw for the first time right before coming to Europe. Colmar is obviously just on the border of France and Germany based on the different architectural styles and languages written and spoken there. In fact Colmar has switched 5 times between French and German rule. The Christmas markets themselves were more spread out throughout the city (5 different areas), which was different from the centralized market in Freiburg.The glühwein here is made with the traditional wine and spices, but also has some brandy in it. The white wine version here is made from Alsace grapes. There were also more crêpe and waffle stations and even a stall selling escargot. I almost tried it, but chickened out when I realized I did not know the proper way to eat them. Food etiquette is a pretty big deal to me in respecting a culture, so escargot will be on the list in the future. I also noticed more people selling lace products in Colmar and fewer wooden products. It was great to experience two different markets to get a feel for what they have in common and how regional differences play into their diversity as well. Back at my flat, this winter season has brought with it many awesome surprises. One of my flatmates, Hanna, organized an advent calendar. Nine of the flatmates contributed 3 presents each (that were 5 euros or less in cost). 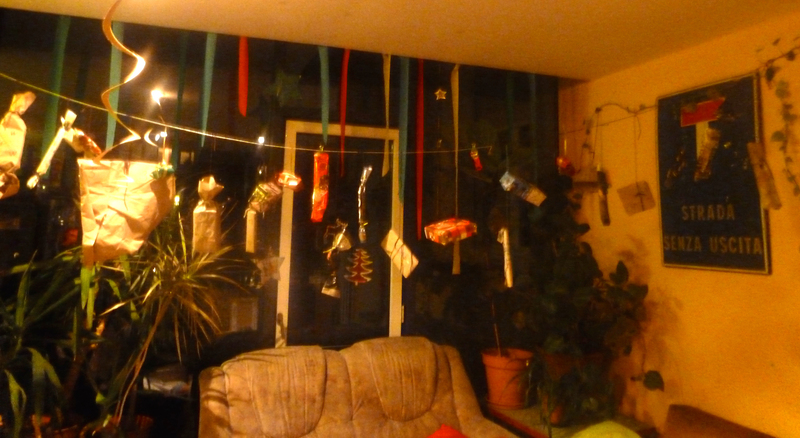 We hung the presents up in the living room as part of our Christmas decorations. Each day one person opens the presents (we have a list on the wall to keep track of who opens a present on which day). So far I have opened two presents: a cloth pencil/paintbrush holder and a bar of chocolate. A few days ago I woke up and found Stutenkerl, barely sweet dough, in the shape of a man on the handle of my door. 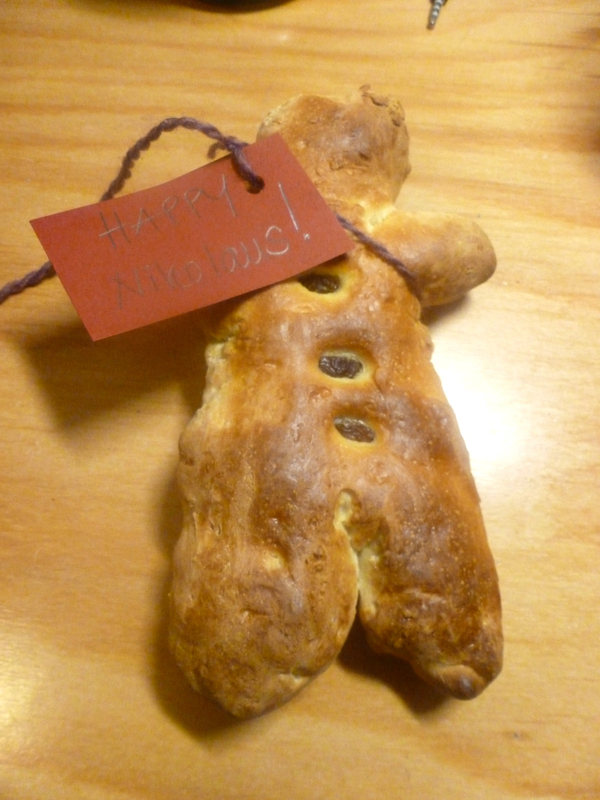 This was to mark St. Nikolaus Tag (St. Nicholas Day) on December 6th. French legend has it that a hungry butcher killed three lost boys, but that St. Nicholas brought them back to life. My flat had a Christmas dinner this weekend with knödel, which are round bread dumplings, along with different soups and salads. For dessert we had baked apples filled with nuts and topped with vanilla sauce. It was great to have this bonding experience just one week before I move out. I am excited to enjoy my last month or so in Europe with family, friends, travel, and great food. But I really am also ready to come home to fulfill all my plans. Through this time abroad I set up an opportunity to shadow a genetic counselor, volunteer training at a domestic violence shelter in Richmond, and joined an organization called WILL* (formerly known as Women Involved in Living and Learning) at my school. I will also be able to declare a double major in biology and environmental studies and a minor in Women, Gender, and Sexuality Studies. Not to mention when I get home I turn 21 two days after arrival, get to go to Washington D.C. with Oldham Scholars, and get to settle into the newest dorms on campus in Westhampton Hall. My life is filled with endless blessings. Coming to the end of my time in Germany allows me to reflect on how thankful I am for all my supporters, for all my challengers, and for my privileges, all of which have led me to live this full, spectacular life. This entry was posted on Monday, December 15th, 2014 at 9:45 am and is filed under Diana in Germany, Fall 2014. You can follow any responses to this entry through the RSS 2.0 feed. You can leave a response, or trackback from your own site.